Cell-to-cell transmission of α-synuclein (αS) aggregates has been proposed to be responsible for progressive αS pathology in Parkinson disease (PD) and related disorders, including dementia with Lewy bodies. In support of this concept, a growing body of in vitro and in vivo experimental evidence shows that exogenously introduced αS aggregates can spread into surrounding cells and trigger PD-like pathology. It remains to be determined what factor(s) lead to initiation of αS aggregation that is capable of seeding subsequent propagation. In this study we demonstrate that filamentous αS aggregates form in neurons in response to apoptosis induced by staurosporine or other toxins-6-hydroxy-dopamine and 1-methyl-4-phenylpyridinium (MPP+). Interaction between αS and proaggregant nuclear factor(s) is associated with disruption of nuclear envelope integrity. Knocking down a key nuclear envelop constituent protein, lamin B1, enhances αS aggregation. Moreover, in vitro and in vivo experimental models demonstrate that aggregates released upon cell breakdown can be taken up by surrounding cells. Accordingly, we suggest that at least some αS aggregation might be related to neuronal apoptosis or loss of nuclear membrane integrity, exposing cytosolic α-synuclein to proaggregant nuclear factors. These findings provide new clues to the pathogenesis of PD and related disorders that can lead to novel treatments of these disorders. Specifically, finding ways to limit the effects of apoptosis on αS aggregation, deposition, local uptake and subsequent propagation might significantly impact progression of disease. The online version of this article (doi: 10.1007/s00401-016-1542-4) contains supplementary material, which is available to authorized users. 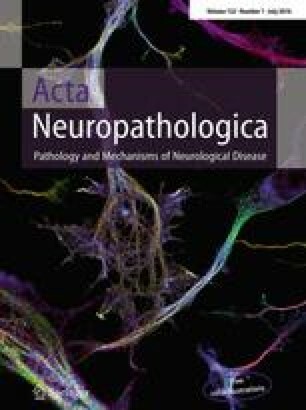 Neuronal intracellular aggregates of α-synuclein (αS) in Lewy bodies and Lewy neurites are pathological features of Parkinson’s disease (PD) and related synucleinopathies such as dementia with Lewy bodies . Although the mechanisms underlying αS pathology remain unclear, the possibility that abnormal conformers of αS may propagate from one cell to another has drawn increasing attention [2, 3]. Cell-to-cell propagation has been proposed to explain the spread of αS pathology observed in cross-sectional studies of brains with a range of severity of PD pathology and conceptually organized into stages by Braak et al. . The presence of αS pathology in neurons of embryonic mesencephalic grafts implanted into the neostriatum to treat PD patients after a lag of about 10 years also supports the possibility that αS spreads from host to graft [5, 6]. In addition, a growing body of in vivo and in vitro experimental evidence supports the possibility that αS can spread from cell to cell [7, 8, 9, 10, 11]. Inherent to this hypothesis is initial formation of “seeds” of abnormal αS in selectively vulnerable neuronal populations, which subsequently propagate [3, 12]. The origin of the seeds in experimental studies has been abnormal conformers of recombinant wild-type or mutant αS or sonicated fractions “preformed fibrils” from post-mortem PD brains [8, 9, 10]. Neurodegeneration in PD and related disorders is a chronic, progressive process associated with neuronal cell death, associated energy failure and disruption of cellular integrity, which are features of cells undergoing apoptosis . Evidence from postmortem brains of PD [14, 15], animal models of PD [16, 17], as well as in vitro cell culture studies [18, 19] strongly suggest that αS-associated neuronal death is apoptotic. Moreover, there is evidence for a proapoptotic environment in the substantia nigra in PD . The identification of high-molecular-weight αS species in cells expressing αS subjected to apoptosis [20, 21] prompted us to investigate if αS aggregation is induced by apoptosis and to determine factor(s) that promote pathologic αS aggregation, which may be seeds for eventual cell-to-cell transmission. In the present study, we employed cell- and animal-based studies to explore mechanisms of αS aggregation in apoptotic neurons. We demonstrate that filamentous αS aggregates rapidly form in apoptotic neurons through an interaction between αS and proaggregant nuclear factor(s) following disruption of the nuclear envelope. Moreover, αS aggregates released upon cell breakdown can be taken up by surrounding cells in both in vitro and in vivo experimental models. These data support the possibility that loss of nuclear membrane integrity plays an important role in αS pathology. We used a dopaminergic neuronal cell model, BE(2)-M17D/3D5, which is derived from human neuroblastoma BE(2)-M17D cell line  that expresses human wild-type αS upon TetOff induction and displays neuronal phenotypes under retinoic acid-induced differentiation . BE(2)-M17D/3D5 cells were maintained in DMEM/10 % fetal bovine serum with 2 μg⁄ml Tet at 37 °C and 5 % CO2. Cells were seeded at the density of 3 × 106 cells/plate (100 × 20 mm, BD Biosciences, San Jose, CA) or 5.0 × 105 cells/well in 6-well plates for biochemical analysis, and 2 × 104 cells/well on coverslips in 24-well plates for immunocytochemistry. For differentiation and αS induction, media were replaced with Neurobasal medium (Invitrogen, Thermo Fisher, Waltham, MA), 2 % B-27 supplement (Invitrogen, Thermo Fisher), 2 mM l-glutamine (Sigma-Aldrich, Saint Louis, MO) and 10 μM RA (Sigma-Aldrich). A previously described H4 neuroglioma cell line that inducibly co-expresses the N-terminal half of Venus YFP tagged to αS (V1S) and C-terminal half of Venus YFP tagged αS (SV2) upon TetOff induction, named as H4/V1S-SV2 , were maintained in OPTI-MEM (Invitrogen) medium supplemented with 10 % fetal bovine serum (Invitrogen), 200 µg/ml Hygromycin B, 200 µg/ml G418 and 2 μg⁄ml Tet and incubated at 37 °C. The Lund human mesencephalic (LUHMES) cell line (LUHMES ATCC® CR-2927) is a subclone of the Tet-controlled, v-myc-overexpressing human mesencephalic-derived cell line. It can be differentiated into dopamine-like neurons . Cells were cultured in advanced DMEM/F-12/Glutamax medium supplemented with N2 supplement (Invitrogen) and 40 ng/ml FGF2 (R&D Systems, Minneapolis, MN) at 37 °C according to published methods . Culture plates were pre-coated with 50 µg/ml poly-l-ornithine (Sigma-Aldrich) and 1 µg/ml fibronectin (Sigma-Aldrich, F1141). For differentiation, media were replaced with advanced DMEM/F-12/Glutamax/N2 medium (Invitrogen) containing 2 ng/ml human recombinant glial cell-derived neurotrophic factor (R&D Systems), 1 mM cAMP (Sigma-Aldrich) and 1 µg/ml Tet for 4 days. For primary cultures, cortical/hippocampal neurons from embryonic C57BL/6 wild-type mice were seeded on poly-d-lysine (Sigma-Aldrich) coated 6-well plate at about 1 × 106 cells per well. Experimental protocols for primary cultures were the same as those reported previously . Lentiviral plasmids carrying αS (EX-G0543-Lv105) were purchased from Genecopoeia, Rockville, MD, and shRNAs of human LMNB1 were purchased from Sigma-Aldrich. The preparation of Lentivirus carrying genes of interest or shRNA was the same as described previously . Nuclear and cytoplasmic fractions were isolated using NE-PER nuclear and cytoplasmic extraction reagents (Thermo Scientific, Waltham, MA) following the manufacturer’s instructions, but with some modifications. Briefly, cells were resuspended in cytoplasmic extraction reagent I, incubated for 10 min, followed by the addition of cytoplasmic extraction reagent II and centrifugation at 16000×g for 5 min. Supernatant was kept as cytoplasmic fraction. The insoluble pellet was further mixed with nuclear extraction reagent and subjected to sonication for 3 min followed by centrifugation at 16000×g for 10 min. The supernatant was then kept as nuclear fraction. The whole process was done on ice or at 4 °C. The bicinchoninic acid (BCA) assay was used for protein quantitation. Apoptotic bodies were isolated according to a previously reported protocol . Medium from 10 plates (100 × 20 mm) of apoptotic neurons was collected and clarified from dead cells and cell debris by centrifugation (800×g, 10 min). The apoptotic body-enriched supernatant was further centrifuged (16000×g, 20 min) to generate a final pellet containing apoptotic bodies. The pellet was either stored at −80 °C for future use or resuspended immediately in PBS. Apoptotic bodies were fractionated to derive 1 % sarkosyl-insoluble material following previously reported protocols . The sarkosyl-insoluble material was resuspended in 50 mM Tris (pH 8.0) and used for electron microscopy and immunoelectron microscopy as described previously . Cell cultures were harvested and centrifuged at 200×g for 15 min. The pellets were resuspended in MES buffer (20 mM MES, pH 6.8; 80 mM NaCl, 1 mM MgCl2, 2 mM EGTA, 10 mM NaH2PO4, 20 mM NaF, phenylmethylsulfonyl fluoride PMSF, 1 μg/ml and leupeptin, 10 μg/mL)  supplemented with phosphatase inhibitors and then sonicated for 1 min, followed by centrifugation at 180×g for 15 min. The whole process was done at 4 °C. The cell lysates were mixed with 6 × SDS-PAGE sample buffer (375 mM Tris–HCl, 12 % SDS, 60 % Glycerol, 12 % 2–Mercaptoethanol, 0.03 % Bromophenol blue), boiled for 10 min and resolved by SDS-PAGE using 10–20 % Tris/Glycine gel (Bio-Rad, Hercules, California). Precision Plus protein standards (Bio-Rad) were included as references. After gel electrophoresis, proteins were transferred onto polyvinylidene difluoride (PVDF) membranes. Antibodies used for western blot studies are as follows: total αS (Syn1; mouse monoclonal IgG1; cat. #: 610787) from BD Bioscience; phospho-serine-129 αS (pSyn #64, mouse IgG1; cat #: 015-25191) from Wako USA, Richmond, VA; pore membrane protein of 121 kDa (POM121) (N2N3, rabbit polyclonal; cat #: GTX102128) from GeneTex, Irvine, CA; lamin B1 (LMNB1) (rabbit polyclonal; cat #: 12987-1-AP) from Proteintech, Rosemont, IL; Histone H3 (rabbit polyclonal; cat # ab1791) from Abcam, Cambridge, MA; cleaved caspase 3 (rabbit polyclonal to human cleaved caspase 3 (Asp175); cat #: 9661) from Cell Signaling, Danvers, MA; α-tubulin (rabbit monoclonal; Epitomics cat #: 1878-1) from Abcam, Cambridge, MA; and β-actin (mouse monoclonal IgG2a; cat #: A5316) from Sigma, Saint Louis, MO (A5316). Western Lightning Plus ECL (PerkinElmer, Bridgeville, PA) or ECL™ Prime Western Blotting Detection Reagent (Fisher Scientific, Pittsburgh, PA) was used for visualization of protein immunoreactivities. The results of western blots were quantified using ImageJ software. Expression levels of proteins of interest were normalized to internal control. Data from at least 3 sets of independent experiments were analyzed by one-way ANOVA with Dunnett’s post hoc test for statistical significance. H4/V1S-SV2 cells with αS induction for 5 days were cultured in reduced serum medium (Cat. No. 31985-062, Invitrogen) in Lab-Tek™ Chambered Cover Glass System (4 well, Nunc™ Lab-Tek II, Sigma-Aldrich). After exposure to staurosporine (STS), cells were subjected to time lapse imaging (interval time = 10 min, 16 h for early or 36 h for later stage of apoptosis) by confocal microscopy (Zeiss LSM 510, Carl Zeiss MicroImaging, Pleasanton, CA) at 37 °C to monitor formation and distribution of αS aggregates. Three independent experiments were performed to confirm the results. In each experiment, 5 fields (upper left, upper right, center, lower left and lower right) with at least 90 cells were chosen for counting the ratio of cells having predominant αS aggregation in nuclei after 16 h of STS treatment. Cells grown on cover slips were rinsed with PBS, fixed in 4 % paraformaldehyde and permeabilized with 0.1 M Tris-buffered saline (TBS; pH 7.6) containing 0.5 % Triton X-100 for 5 min. They were subsequently blocked with 3 % goat serum in TBS, incubated with primary antibodies (rabbit anti-Flag from Sigma Aldrich, mouse anti-Myc from cell signaling, or LB509 from Invitrogen) in TBS containing 1 % goat serum overnight at 4 °C and then incubated for 1 h with secondary antibodies. Immunolabeled cells were stained with nuclear stain DAPI (Invitrogen) for 10 min and observed by confocal fluorescence microscopy (Zeiss LSM 510, Carl Zeiss MicroImaging, Pleasanton, CA). Three independent experiments were performed to confirm the results. For each in situ cell uptake experiment, at least 60 αS-Flag cells were included for counting of cells bearing particles positive with Myc and Flag tags. All animal procedures were approved by the Mayo Clinic Institutional Animal Care and Use Committee. C57BL/6 mice (12 months of age) were anesthetized with 3 % isoflurane and stereotaxically injected with different samples. For cell lysates and apoptotic bodies, 20 µg total protein per brain was injected. Control mice were injected with PBS to exclude any effects due to surgery and injection. A single-needle insertion (coordinates: X = 2.0 mm; Y = 0.2 mm; Z = 0.8 and 2.6 mm, respectively) into the left forebrain was used to deliver the inoculum to somatosensory cortex and dorsal neostriatum. Material was injected via a Hamilton syringe at a rate of 0.5 μl per min (5 μl total per site). After recovery from surgery, animals were monitored regularly. A week later, animals were subjected to transcardial perfusion with PBS, and brains were fixed in 10 % formalin followed by paraffin embedding. Coronal sections were cut at 5-micron thickness for immunohistochemical and immunofluorescent staining. Apoptotic bodies were resuspended in TBS at pH 7.4 and 10 µM Thioflavin T. Fluorescence was measured immediately at 440 nm (excitation)/460–600 nm (emission) with a Cary Eclipse fluorescence spectrophotometer (Varian, Palo Alto, CA). After subtraction of background signals from reagent alone, the fluorescent signals from the peak areas were integrated . Sections of paraffin-embedded tissue were sequentially subjected to deparaffinization, rehydration, steaming in DAKO target retrieval solution pH 6.1 for 30 min, digestion with Protease 24 for 8 min at room temperature (only for staining with LB509) and blocking with Protein Block (X0909, DAKO, Carpinteria, CA) for 1 h at room temperature. For immunoperoxidase labeling, sections were treated with 3 % hydrogen peroxide to block endogenous peroxidase and then incubated with 5 % normal goat serum for 20 min to reduce non-specific labeling. Tissue sections were incubated with antibodies to αS (LB509, 1:100, Invitrogen) for 45 min and Envision-Plus labeled polymer HRP, rabbit or mouse (DAKO) for 30 min. Peroxidase labeling was visualized with a solution containing 3, 3′-diaminobenzidine (DAB-Plus). The sections were subsequently counterstained with Lerner 1 hematoxylin (14-930-11, Fisher Scientific) and coverslipped with cytoseal mounting medium (8310-16, Richard-Allan Scientific, Kalamazoo, MI). For immunofluorescence, sections were incubated with Protein Block (X0909, DAKO) for 1 h at room temperature. The sections were incubated with antibodies to MAP2 (1:1000, chicken polyclonal, EnCor Biotechnology, Gainesville, FL) and αS (LB509, 1:100, Invitrogen) at 4 °C overnight, followed by 1.5 h of incubation with secondary antibodies (1:500) after washing. Non-specific fluorescence signals were blocked by staining with Sudan Black. Sections were coverslipped with Vectashield mounting media (H-1200, Vector Laboratories, Burlingame, CA) and viewed with confocal microscopy. To determine if apoptosis can trigger intracellular αS aggregation, staurosporine (STS), a well-known neuronal apoptosis inducer, was used to treat differentiated BE(2)-M17D/3D5 cells because it has been shown that exposure of neurons to 30–100 nM STS can induce concentration-dependent apoptotic degeneration . As expected, BE(2)-M17D/3D5 cells exposed to 50 or 100 nM STS showed time- and dose-dependent increases in both cleaved caspase 3, a molecular marker of apoptosis, and in SDS-resistant aggregated αS (Fig. 1). αS aggregation was observed as early as 4 h after exposure to STS (Fig. 1c, e), indicating that factor(s) associated with apoptosis rapidly trigger pathologic assembly of αS. Pretreatment with a caspase inhibitor (CI)-Z-VAD-FMK, a cell-permeant pan-caspase inhibitor that irreversibly binds to the catalytic site of caspase proteases, significantly reduced both caspase activation and αS aggregation (Fig. 1c, e), confirming that apoptosis contributes to formation of αS aggregates. To determine whether αS aggregation in response to apoptosis is unique to BE(2)-M17D/3D5 cells, we included two other cell models, differentiated LUHMES cells (Fig. 2a) and primary mouse cortical neurons (Fig. 2b). Since increased levels of αS can accelerate aggregation , the two cell models were infected with lentivirus carrying human αS to increase its expression. In both cell models SDS-resistant αS aggregates formed after STS treatment in a time-dependent manner, and pretreatment with the caspase inhibitor blocked both apoptosis and αS aggregation (Fig. 2). To further determine if apoptosis-triggered αS aggregation has physiological relevance, we used STS to treat primary neurons bearing only endogenous αS. As a positive control, we included sibling cultures infected with lentivirus carrying human αS. The results showed that endogenous αS (EN) can also form aggregates in response to STS treatment, but the magnitude of aggregation is much less compared to that in neurons overexpressing αS (EX) with lentivirus infection (Fig. 2c). To study dynamic changes in αS aggregation during apoptosis, a fluorescence complementation assay with the H4/V1S-SV2 cell line was used. This cell line expresses αS tagged with a split Venus YFP molecule. Binding of V1S to SV2 upon αS–αS interaction can reconstitute fluorescence and indicates αS aggregation . After 5 days of induction, H4/V1S-SV2 cells were exposed to 25 nM STS and subjected to time-lapse confocal microscopy to monitor αS aggregation. Unexpectedly, after 16 h of STS treatment, most cells (91 ± 3 %) showed predominant fluorescent signals in nuclei, suggesting that the nuclear environment in neurons undergoing apoptosis favors αS aggregation. At later stages of apoptosis, associated with nuclear condensation, αS aggregates were detected in the cytoplasm, and finally they were released into the media, where some bound to nearby cells (Fig. 3a, b). To support findings from live cell imaging, we performed nuclear and cytoplasmic protein fractionation of STS-treated neuronal cultures. The BE(2)-M17D/3D5 human dopaminergic cell line was chosen because it inducibly expresses wild-type human αS at a high level amenable to biochemical analyses . Differentiated BE(2)-M17D/3D5 cells with 5 days of αS induction were collected at various time points following exposure to STS. Nuclear and cytoplasmic fractions were prepared and analyzed with dot blots, as well as with sodium dodecyl sulfate polyacrylamide gel electrophoresis (SDS-PAGE) western blots. As expected, dot blots revealed more αS in cytoplasmic than nuclear fractions (Fig. 3c, Supplementary Fig. A1), consistent with previous study results showing that αS is predominantly a cytoplasmic protein. Total αS progressively increased in the nuclear fraction following induction of apoptosis with STS, suggesting that αS translocates to the nucleus with apoptosis. Western blots showed that the cytoplasmic fraction had much more monomeric αS than the nuclear fraction when the same amount of total proteins from each fraction were compared; whereas higher molecular weight αS aggregates are more apparent in nuclear compared to cytoplasmic fractions (Fig. 3c, Supplementary Fig. A1). These results suggest that the nuclear fraction contains factor(s) that promote αS assembly. Moreover, αS aggregation increases in a time-dependent manner after induction of apoptosis in both nuclear and cytoplasmic fractions (Fig. 3c, Supplementary Fig. A1). Since translocation of αS to the nucleus persisted during apoptosis, it was not surprising to see progressive increase of αS aggregation in the nuclear fraction with progression of apoptosis. It was not immediately clear why aggregation of cytoplasmic αS also increases with progression of apoptosis; however, it is possible that nuclear factor(s) promoting aggregation may translocate from nucleus into the cytoplasm given that a representative nuclear protein (histone H3, Fig. 3c) gradually increases in cytoplasmic fractions with progression of apoptosis (Supplementary Fig. A1). To confirm the role of nuclear factor(s) in facilitating αS aggregation, the same amount of protein (50 µg) from nuclear and cytoplasmic fractions of differentiated null M17D cells (without αS overexpression) with or without 8 and 16 h of STS treatment was incubated with freshly prepared recombinant αS (10 µg) as described previously  for 30 min at 37 °C. At baseline, αS aggregates were minimal-to-nonexistent when recombinant αS was mixed with either cytoplasmic fraction buffer or nuclear fraction buffer, but αS aggregates rapidly appeared in preparations exposed to nuclear fractions from both STS-treated and non-treated cells (Fig. 3e, Supplementary Fig. A1), supporting the presence of nuclear factor(s) that facilitate αS aggregation. Interestingly, in STS-treated cells, the effect of cytoplasmic fraction on αS aggregation was positively correlated with the duration of treatment, consistent with the hypothesis that as apoptosis progresses, proaggregant nuclear factor(s) increasingly gain access to cytoplasm. Given that nuclear envelopes block free passage of molecules between nucleus and cytoplasm and that apoptosis is associated with degradation of the nuclear envelope , we hypothesized that progressive increases in nuclear proaggregant factor(s) in the cytoplasm would correlate with disruption of the nuclear envelope. We addressed this by measuring the status of two key proteins of the nuclear envelope, pore membrane protein of 121 kDa (POM121) and lamin B1 (LMNB1), in STS-treated neuronal cultures for their relation to increases in αS aggregation (Fig. 1b, c). We postulated that neurons with compromised nuclear envelope integrity due to decreased expression of key structural components of nuclear membrane would have increased susceptibility to STS and that αS aggregation would be increased in such cells. To test whether compromised nuclear envelope can trigger αS aggregation, neurons were subjected to knockdown of LMNB1 using lentivirus delivered shRNA, followed by STS or vehicle treatment. We found neurons deficient in LMNB1 (expressing less than 20 % of control levels) had significantly more αS aggregates than cultures exposed to the same dose of lentivirus carrying control vector (Fig. 3g, Supplementary Fig. A1), suggesting that loss of nuclear envelope integrity was associated with increased vulnerability to αS aggregation. Cultures with LMNB1 knockdown to around 50 % of control had similar expression of αS as controls, but they had significantly more αS aggregates than controls at the same dose and duration of STS treatment, suggesting that neurons with deficient constituent proteins of nuclear envelope are more vulnerable to αS aggregation. Because phosphorylated αS (p-αS) accumulates in Lewy bodies and Lewy-related pathology , we immunostained apoptosis-induced αS aggregates for the presence of this post-translational modification. Western blots of cell lysates from differentiated BE(2)-M17D/3D5 cells, as well as LUHMES cells and primary neurons subjected to STS-induced apoptosis all had time-dependent increases of p-αS (Figs. 1b, d, 2a, d, e). Because STS is not a toxin that triggers PD-related pathology in humans and animal models, we performed similar experiments in neuronal cultures exposed to other neurotoxins commonly used in PD research. Differentiated BE(2)-M17D/3D5 cells overexpressing αS were treated with 1-methyl-4-phenylpyridinium (MPP+) [36, 37] or 6-hydroxy-dopamine (6OHDA) [38, 39]. As expected, time-dependent aggregation and phosphorylation of αS were observed in neuron cultures with apoptosis induced by both neurotoxins (Fig. 4a). Furthermore, nuclear and cytoplasmic fractionation demonstrated that (1) cytoplasmic fractions contained more monomeric αS than nuclear fractions (Fig. 4b); (2) αS aggregates that formed in nuclear fractions had higher molecular weight than those in cytoplasmic fractions; and (3) αS aggregates increased in a time-dependent manner upon induction of apoptosis in both nuclear and cytoplasmic fractions. The changes observed in αS aggregation and phosphorylation and subcellular distribution of αS aggregates in BE(2)-M17D/3D5 cells treated with MPP+ and 6OHDA were similar to those observed with STS, suggesting apoptosis may play a role in toxicity of other neurotoxins, at least in terms of their effects on αS aggregation in neuronal cultures. Because αS aggregates increasingly formed during apoptosis and because αS aggregation at later stages of apoptosis was associated with unresolvable high-molecular-weight molecular species at the top of gel (Fig. 1b, c), we examined the morphology of αS aggregates in cultures at late stages of apoptotic cell death. Thirty-six hours after STS treatment, differentiated BE(2)-M17D/3D5 cells were subjected to immunocytochemical staining with LB509 to detect αS aggregates . At this late stage of apoptosis, cells showed disrupted nuclear profiles and more αS aggregation than that observed in intact nuclei at earlier stages of apoptosis (Fig. 5a). Of note, αS aggregates were observed not only in apoptotic bodies, but also in smaller structures (arrowheads in Fig. 5a). These findings suggest that a range of αS aggregates can be released into the extracellular milieu from apoptotic cells. Given the striking degree of αS immunoreactivity in apoptotic bodies, we explored their ultrastructural characteristics to determine if apoptosis-associated αS was filamentous, as in Lewy bodies. Cell lysates from differentiated BE(2)-M17D/3D5 cells without STS treatment, and apoptotic bodies isolated from STS-treated differentiated BE(2)-M17D/3D5 cells or null M17D cells, were fractionated. Sarkosyl-insoluble fractions were processed for immunoelectron microscopy. Interestingly, filamentous structures were detected in BE(2)-M17D/3D5 cells derived from apoptotic bodies (Fig. 5b, left), but not in other samples (data not shown). The filaments were immunopositive for αS (Fig. 5b, right), which suggests that filamentous αS can be formed in apoptotic bodies of cells overexpressing αS. Since αS aggregates in apoptotic bodies can be released upon disruption of the cell membrane, we investigated if aggregates of αS can be internalized by surrounding cells as described in previous study . To address this issue, we employed two different neuronal cell models derived from M17D neuroblastoma cell line. One overexpresses Myc-tagged αS (Myc-αS) is neomycin resistant and sensitive to puromycin; the other overexpresses Flag-tagged αS and is puromycin resistant, but sensitive to neomycin. Differentiated Myc-αS cells were treated with puromycin, which triggers apoptosis, for 36 h to produce Myc-αS aggregates associated with apoptotic bodies . Isolated apoptotic bodies were sonicated for a thioflavin T binding assay  to first confirm the formation of filamentous αS (Fig. 5c), then added to differentiated αS-Flag cells. Apoptotic bodies from puromycin-treated differentiated mock transfectants were used as a control. After 3 days of exposure to sonicated apoptotic bodies, cells were fixed and immunolabeled with antibodies to Flag and Myc tags. Myc-αS aggregates were observed on the cell surface and in the cytoplasm of most αS-Flag cells treated with Myc-αS sonicated apoptotic bodies, but not in control cells (Fig. 5d). These findings suggest that Myc-αS aggregates can bind to and be taken up by αS-Flag cells. To determine if neuronal cells can directly take up αS aggregates released from surrounding apoptotic cells, αS-Flag cells were co-cultured with Myc-αS or mock transfected M17D cells at equal density and subjected to differentiation for 5 days and maintained in media with or without puromycin for another 5 days before fixation and immunostaining. Apoptotic bodies, characterized by DAPI-positive nuclear debris, were observed in puromycin-sensitive Myc-αS cells bound to Flag-αS cells (Fig. 5e). In addition, apoptotic bodies in the process of decomposition appeared to be internalized into puromycin-resistant αS-Flag cells, suggesting that the apoptosis-induced αS aggregates can spread to surrounding cells in vitro. Furthermore, about 10 ± 3 % of the αS-Flag cells had internalized Myc-immunopositive particles that were co-labeled with Flag antibody (Fig. 5e), consistent with recruitment of endogenous αS-Flag protein into Myc-αS seeds. To determine if apoptosis-induced αS aggregates can be taken up by neighboring cells in vivo, apoptotic bodies from STS-treated differentiated BE(2)-M17D/3D5 cells with and without αS overexpression were isolated and stereotaxically injected into somatosensory cortex and dorsal neostriatum of wild-type C57BL/6 mice at ≈12 months of age following methods of Luk et al. . Cell lysates from BE(2)-M17D/3D5 cells with αS overexpression, but without STS treatment, were included as a control. All injected materials were subjected to thioflavin T assay and SDS-PAGE/western blots (Fig. 6a, b) to confirm the presence of αS aggregates in the materials used for brain injection. After 1 week, brains were harvested, fixed and embedded in paraffin for immunohistochemical studies. Human αS pathology was detected in the vicinity of the injected lysates from STS-treated cells in the form of neocortical neuronal perinuclear αS deposits (Fig. 6d, ii1 in c), while thread-like and dot-like αS deposits were detected in somatosensory cortex and dorsal neostriatum (Fig. 6c, insets). In contrast, cell lysates not treated with STS or those treated with STS, but not overexpressing αS, did not have neuronal cytoplasmic or neuritic αS pathology (Fig. 6c, insets). These results suggest that αS aggregates from apoptotic neurons can be taken up by neurons in vivo. Our study suggests that neuronal αS aggregation may be triggered in some cases by proaggregant nuclear factor(s) associated with apoptosis. These initial aggregates may then serve as sources for αS pathology in the immediate vicinity of the affected neurons, which may eventually propagate to more distant sites, possibly by cell-to-cell transmission. Although we demonstrated that filamentous αS aggregates form quickly in apoptotic neurons, it remains to be determined whether this process occurs in PD and related disorders. Apoptosis is thought to play a role in neuronal cell death in PD and related disorders. Specifically, markers of apoptosis have been demonstrated in postmortem brains of PD [14, 15], as well as animal models [16, 17] and cellular models of PD [18, 19]. Moreover, it has been suggested that apoptosis is the most common type of neuronal death in PD and that there is a proapoptotic environment in the substantia nigra in PD . Therefore, the proapoptotic environment and apoptotic neuronal death in PD and related disorders provide support for a role of apoptosis-associated proaggregant factor(s) in αS aggregation. Effective clearance mechanisms in the brain quickly remove apoptotic neurons and their breakdown products . Under normal circumstance αS aggregates would most likely be cleared and not propagate to adjacent cells. When neuronal death occurs in vulnerable neuronal populations in PD and related disorders, there may be incomplete clearance of breakdown products from apoptotic neurons and subsequent propagation of αS aggregates. Aging is the major risk factor for PD, and it is associated with decline in function of the immune system . Thus, in the aged brain apoptosis-associated αS aggregates may be more prone to propagation. A caveat of our studies is that they were conducted in a human dopaminergic cell line that inducibly overexpresses αS. This issue is raised because a critical concentration of αS is required to initiate its assembly [33, 45], and the neuronal cultures used in many PD cell models have αS overexpression. The rationale for using models with αS overexpression is that familial PD with multiplication of the αS gene (SNCA) have increased expression of wild-type αS [46, 47, 48, 49] as well as severe αS pathology . Even in normal human aging and in older animal brains, αS expression levels have been shown to be increased compared to younger individuals [51, 52, 53, 54]. Although it remains unclear what concentration of αS is critical for its aggregation in PD and related disorders, the fact that αS aggregates can be observed in brains of aged animals and neurologically normal humans indicates that on a cell-by-cell basis there is a sufficient concentration of αS to lead to aggregation even in normal individuals. We propose that rapid formation of αS aggregates in neurons undergoing apoptosis is a consequence of nucleocytoplasmic barrier disruption and the subsequent interaction between cytoplasmic αS and proaggregant nuclear factor(s). Although previous studies have shown that αS can be transported into the nucleus upon induction of oxidative stress either as an N-terminal truncated form  or as full length form mediated by importin , these mechanisms are probably not relevant to our observations. First, using fluorescent complementation assays that are dependent upon integration of full-length tagged αS molecules to monitor αS oligomerization, we observed nuclear signals upon indication of apoptosis. Second, we did not detect evidence of truncated αS in western blots of nuclear fractions. Thus, it does not appear that truncation of αS is necessary for nuclear translocation in the setting of apoptosis. Third, our results showed that αS aggregation associated with apoptosis is accompanied by degradation of nuclear envelope (Figs. 1, 2). Although we cannot completely exclude the possibility that some αS may be transported into the nucleus by importin during apoptosis, this physiological process of nuclear pore complex transport may be minimal in a cell where there is considerable disruption of the nuclear envelope. The αS aggregates formed in apoptotic neurons share important features with pathological αS from PD and related disorders, such as filamentous structures, thioflavin binding, serine-129 phosphorylation and the ability to enter neuronal cells, suggesting similarities between αS aggregates formed under in vitro and in vivo conditions. Although we clearly demonstrated predominant nuclear localization of proaggregant factor(s) and cellular uptake of αS aggregates formed upon disruption of nuclear envelope, we do not know the nature of nuclear proaggregant factor(s) and how αS rapidly forms aggregates upon interaction with these factors. Since it has been shown that the loss of nuclear integrity is accelerated in post-mitotic cells in an age-dependent manner , it is possible that chronic nuclear “leakiness” of proaggregant factor(s) might also contribute to accumulation of αS aggregates in brains of aged human . Overall, our study suggests that a source of pathological αS in PD and related disorders might be from apoptotic neurons in which αS rapidly forms aggregates due to disruption of nuclear membrane and exposure of cytosolic αS to proaggregant nuclear factor(s). Accordingly, at least some αS aggregates might be a secondary phenomenon generated during neuronal apoptosis. The primary insult that leads to apoptosis is unknown; however, once triggered, the effects of apoptosis on αS may accelerate a pathological cascade that eventually leads to local and more distant neurodegeneration. While it is important to determine the cause of neuronal apoptosis or leakiness of nuclear membrane that may possibly expose cytosolic αS to nuclear proaggregant factors in selectively vulnerable neuronal populations in PD and related disorders, finding ways to limit the effects of apoptosis on αS aggregation, deposition, local uptake and propagation might significantly impact progression of the disease. The current observations suggest novel processes in the pathogenesis of PD and related disorders and may open the door to innovative treatments. The authors thank Monica Castanedes-Casey and Virginia Phillips for their histologic support. This study was supported by the National Institute of Health (P50-NS072187 and R01-NS073740), the Mangurian Foundation Lewy Body Dementia Program at Mayo Clinic (Dickson, Jiang and Yen). All authors have no actual or potential conflicts of interest.